As a former editor at Marvel Comics and a current editor at IDW Publishing, the question I get asked the most is how do writers and artists break into comics. Good question and the truth is there is no one right way. No one proven way to always break into comics. But there are certainly strategies. I’ll be posting tips on the topic periodically on the blog and now seems like a good time to start. We had our last night of class for the online writing group tonight and it was awesome. We spent most of the night talking about exactly this topic. So, if you find this useful, you can thank the latest Intro to Comics Writing class for asking it. When going to a convention to meet creators and publishers and/or have your work evaluated, do yourself a huge favor and do research before you go. 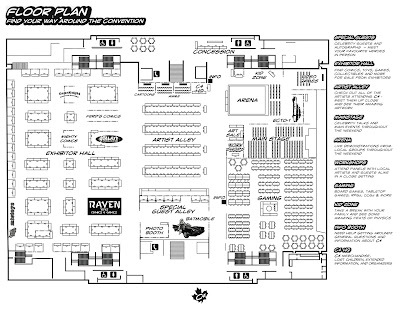 Almost every convention has a map of the floor plan so you can know where the people and companies you want to meet with are located. Print it out. Mark a planned path. And mark a path for each day. Don’t get too ambitious. You probably won’t be able to see everyone, especially at a larger convention. But mark your path. This will help you maximize your time on the floor so you’re not walking back and forward between places all day long. It also means you won’t in the thick of it all forget that there was a publisher or creator you wanted to meet and you just never saw them or him or her. It means you have a strategy. 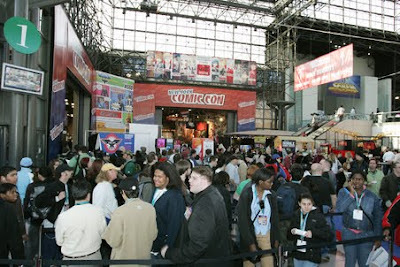 Also review the lists of creators and publishers attending. If you’re interested in getting work at a publisher, look them up on the Internet and find out what kind of things they publish. If it looks at all interesting to you or you think what you write or illustrate might fit in their publishing plans, go get some of their books and get familiar with the work. It allows you to speak intelligently about their products so you can help ease any conversation you may have.